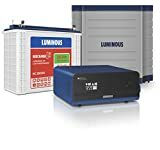 Top 10 Best Inverter Batteries in India 2019 - Top 10 In India - Only The Best of everything! LATEST product list, updates regularly! Following are some of the points to be noted. First, the size of the inverter and the accompanying batteries. This is an important consideration that is often overlooked. If it is a double battery inverter, the rack required for the inverter and the two batteries could be like a medium sized book rack! So do think of the place where you propose to place it in the house. It can be placed near the entrance of the house so that the service personnel can conveniently do their work. Please remember that even the so-called maintenance free inverters and batteries do need some servicing like occasional refill of distilled water etc. There is also the need to have a place with adequate ventilation as the batteries may sometimes foul the air. How much back up time is required is another consideration. In the developing countries where infrastructure facilities are not up to the mark, the outage can easily last 7/8 hours. It is preferable to have the inverter connected to all the points in the house. This will make for convenience for using light or fan anywhere in the house during power outage. We have to remember that power points should be totally avoided. Whenever the inverter is on, all the lights, fans, gadgets etc. should be immediately switched off leaving only the minimum of lights and fans. This is the only way to extract maximum back up time from the inverter and the batteries. The inverter and the batteries should be of well known and reliable brands. India's best known brands for inverter batteries have emerged from two kinds of original manufacturers. The brands that ware originally inverter makers and also make batteries like Su-kam, Luminous and Microtek, and the original battery makers who are now making batteries for inverters, like Amaron and Exide. If you buy form any one of these you will get a good product. The batteries could preferably be maintenance free, although it should be clearly understood that even such batteries also occasionally need refilling of distilled water and other servicing. Also you can check what duration of warranty is being offered by the inverter battery brand. usually a three year warranty works just fine. The capacity of the inverter and the accompanying batteries should be carefully assessed. Please remember that actual capacities are often considerably less than the designated ones. Therefore to be on the safe side it is advisable to keep plenty of margin in capacity. There is no harm in providing for 50 to 100 percent extra capacity for the sake of convenience. Please do not forget that your old inverter and the batteries, specially, have scrap value of which full advantage should be taken while buying new ones. Exide is one of the oldest battery brands in India, which has earned the trust and good will of discerning Indian buyers over many years. An Exide battery will always feature amongst the best inverter batteries in India, and this model, the Exide New Inst Brite 150 ah has been a bestseller for a long time. You can chooose this battery without a worry. Exide has a very good reputation when it comes to makign good and reliabel batteries, and also in termsof post sales service. This battery is best suited for any 12 V inverter. We highly recommend this inverter battery. The Exide Insta Brite comes with a 36 month warranty, which itself is a very good reason to choose this battery. The battery has special float guides to indicate the level of battery water. It is essentially an easy maintenance battery. It has strong moulded handles for easy handling and is completely spill proof, with spill guards and a top vented lid. The Exide Insta Brite is also fume and leakage resistant. The company has given a special page for finding the best fit for your requirement. You can visit the Exide Correct Fitment page here. 1. Most lists have some agenda behind them, either the brands they want to put in front or some incentive to push a particular model. This list of Top Best Inverter Batteries in India only features the top bestsellers, absolutely clear reflection of the number of sales the inverter batteries have. The more the sales, the higher the ranking. 2. These are all very good value for money as they are the most popular. Usually the most expensive or the low quality ones are not bought again and again. Only the inverter battery that has given the best performance at the best price is bought again and again. So from this list you will get tried and tested products that are a great deal at their price. 3. The inverter batteries you see below are updated every day. That means there may be a change every single day you see the list. One battery may go up in the ranking and the other may go down. This way you will get only the latest and best. A great combination to start your search for inverter batteries. That's it, awesome reasons to buy from this list. So go ahead and bring home an inverter battery that will serve you well for years to come. Luminous Zelio is India's most intelligent sine wave home ups. It can power 3 Tubelights of 40 watts each; 3 Ceiling Fans of 90 watts each and 1 LED Television with ease. The Amaron Inverter Tubular Battery has a high tolerance capacity for heat, best suited to Indian weather conditions. It comes witht he highest reserve capacity, and factory charged. The Exide Instabrite Battery comes with a 36 month warranty. Extra thick plates of the Luminous Ecowatt IL18039 150 Ah Battery made of special alloy lead to very low battery maintenance and very good charge acceptance. Easy maintenance possible due to level indicators. Auto holiday mode extends battery life along with no-load shutdown. Excellent charge acceptance is due to inter partition connection that also leads to lowest internal resistance. This battery is ideal for areas with frequent power cuts as it has been designed to have a life of over 1250 cycles at 80% Depth of Discharge (DOD). Even in the event of high voltage, the lead part of the battery is protected from corrosion. You may have decided on a brand of inverter battery, but what about the battery size. It can look very technical but deciding the battery size you need is actually quite straight forward. The first thing you need to know is how the battery sizes are mentioned on the battery. The main specification to see is the Ah or the AH, which is the ampere hour. The ampere hour is the amount of current in amperes the battery can provide for an hour. Thus if you have a battery of capacity 120 Ah, it means that it can provide 120 amperes for an hour, or 40 amperes for 3 hours. The way to calculate what size battery you need for your inverter is quite simple. You just need to multiply the total wattage of the appliances you want to run with the number of hour of backup you need and divide it with the voltage of the battery. Most batteries in India are 12 volt, and this is the norm for calculating the battery size in AH. Here is an example of calculating the required size of a battery. Suppose you want to run 5 fans in your house of wattage 40 watts each. Also you want at least 5 hours of battery back up. Then your total load becomes the total wattage multiplied by the total hours, which is 5X40X5 = 1000 watts. To get the AH of the battery you need, you now need to divide the total load by the voltage of the battery. All batteries in India are of 12 volt. That means your battery size will be 1000 divided by 12, which is 83.3 Ah. The common battery sizes in India are 150 AH and 120 AH. You will find many of the top brands of offering batteries with these size - leading battery brands such as Luminous, Amaron and Exide. Less Prone To Lose Water And Hence Maintenance Not Needed That Often. Contains Low Lead Reserve. Unique Features And Superior Technology: Advanced Hybrid Technology That Is Best Suited To Withstand High Temperatures As Well As Thick Plate Construction With Special Paste Formulation. Special Hybrid Alloy System Leading To Low Water Loss And Dual Plate Separation(Pe+Gm) That Reduces The Possibility Of Premature Failure. Fume and leak resistant: Spark arrestor fitted in float to restrict fumes and acid during operation. Clean top with no surface leakage.